An all-inclusive vacation you won't soon forget! From mid-May to the end of August, ROW Adventures offers all-inclusive (lodge or glamping) packages at River Dance Lodge (our very own Outdoor Adventure Resort). The warm months, cool summer breezes and thick green forests make this the best time of year for a four or five-day vacation in Idaho. Guest's have come to expect top-quality guides on all our adventures and we've rounded up some of the best at River Dance Lodge. They lead exciting activities while telling stories and sharing their knowledge of the forests, rivers and mountains of the surrounding area. Depending on the time of year, our itineraries at the lodge are packed with whitewater rafting thrills on the Lochsa River, hiking tours, mountain biking, gentle floats down the Clearwater or Selway Rivers and fly fishing. We operate all our activities at our lodge so rest assured you'll be well cared for. The great outdoors and beautiful cabins make this the perfect setting for families and groups. There are two options throughout the season: one is a Sunday to Thursday stay and the other is a Thursday to Sunday stay that start at less than $150 per person per day (based on two adults and two kids). We now have glamping (luxury tents) accommodations that can be combined with an all-inclusive stay as well! Many of our river guests on the Snake, Salmon and Middle Fork enjoy coming to the lodge for a night or two an an extesion to their rafting vacation. Please call us if this is something you'd like to do! It is a magnificent time of change and renewal as spring approaches in the Bitterroot region. Bears awaken after long months of winter hibernation, squirrels are playing about, elk move up to the high country and the Syringa, Idaho's state flower, bursts into full bloom. As the climate grows warmer snow starts to melt and the rivers come to life. Whitewater rafting enthusiasts from all over the world come to the Loscha for the best whitewater rafting experience in North America. The river's unique combination of huge volume and steep gradient lures whitewater rafters to the adventure lodge. The wild waters flow for over 60 miles, dropping at an amazing 30 feet per mile. That's almost three times the average of the Colorado River or the Snake in Hells Canyon, which drop at 11 feet per mile. While whitewater rafting in the spring might be the main attraction of River Dance Lodge, an Idaho adventure lodge, we also feature a lot of other exciting outdoor activities for our visitors. You can go on nature hikes to see wildflowers bloom in the nearby mountains or bask in the glorious waters of a wilderness hot spring. Perhaps you would like to learn more about the history of the Nez Perce tribe? Our adventure lodge is an ideal place for history and discovery of this beautiful region. You will find a refreshing taste of nature at River Dance Lodge. 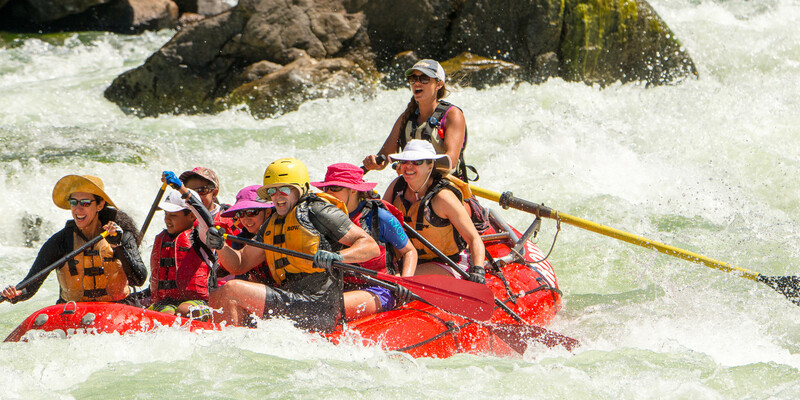 ROW Adventures have been hosting wild whitewater rafting adventures on the Loscha River since 1984 and is the leading rafting outfitter in the area. If you prefer a gentler river or more mellow adventures you can also enjoy a float on the Middle Fork of Clearwater or Selway Rivers, fly fishing instruction, hiking and bike riding. Lodge adventures are especially organized to make the most of your spring time vacation. We offer a five-day vacation package called the Lochsa and Mountain Trails (from Sunday to Thursday) and a four-day vacation package, called the Weekend Whitewater Escape, (from Thursday to Sunday) for you to choose from. Looking for a taste of paradise on earth? Then come spend your summer vacation on the Middle Fork of the Clearwater River in Idaho at our guest ranch. The magnificent, untouched mountains and endless green forests allow you to breath in fresh air and feel a cool gentle breeze on your skin. Make your summer vacation an endless adventure of floating, hiking, biking and just about any nature trip activity that you can think of. Our Idaho guest ranch has friendly, professional guides ready to serve! As you sit on the porch of your very own log cabin at our Idaho guest ranch the clear and sparkling waters of the Middle Fork of the Clearwater River flow by. Just six miles upstream is where the Lochsa and Selway rivers join together to form the Middle Fork of the Clearwater River. These free-flowing rivers are incredibly pristine and home to salmon and steelhead that spawn and migrate from these rivers to the Pacific Ocean and back. Summertime in Idaho is generally hot and dry making it a perfect time to be at our guest ranch. Temperatures range from 80-95 degrees during the day and go down to 55-60 degrees at night. During July to mid-August the water temperatures range from 68-78, which is great for swimming, kayaking and floating. We provide two all-inclusive summer packages for you to choose from. One is a five-day vacation package called Mountain and River Discovery (from Sunday to Thursday) and the other a four-day vacation package called Wild West Weekend (from Thursday to Sunday). Both packages are organized to squeeze in all the fantastic guest ranch adventures you would want. Tamaracks turn to gold and the burning bush turns fiery red. Indeed, autumn in Clearwater Country is a magnificent sight to behold. Animals are in motion as elk descend to the lower country, trout swim to deeper and darker waters and black bears find their dens in preparation for a long winter sleep. Our ranch resort is a central point to witness the change of season. Skies on a typical autumn day in Idaho are clear and sunny, which makes perfect weather for exploring local towns, shops and museums. For a taste of adventure, hike up the mountain trails for a breathtaking views or experience a refreshing bath in a wilderness hot spring about an hour away from the ranch resort.